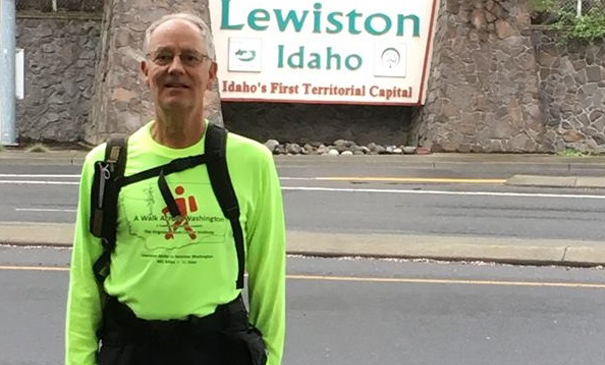 When Don Muggli received a total-knee replacement at Virginia Mason 10 years ago, he never thought he’d be walking across Washington state in 31 days. But when his younger brother, Dale Muggli, died of colon cancer, he wanted to take on a life-changing challenge that would honor his brother, increase awareness of colon cancer, and raise funds for the Virginia Mason Cancer Institute to help other people with this widespread disease. On April 13, at 68 years old, Don started at Lewiston, Idaho, crossed the border into Clarkston, Wash. and walked for 441 miles, 31 days in a row, until he reached Seaview, Wash. and stepped into the Pacific Ocean. Don’s brother Dale was living in Cle Elem when he received his cancer diagnosis in Ellensburg. He was referred to the Virginia Mason Cancer Institute where he had surgery and chemotherapy. He passed away in August of 2015. Learn more about Don’s walk.